A clothing line for women who want to make a statement. If you love all things Disney, especially the Princesses, then you’re going to love our new Hipster Princess Collection. We first fell in love with hipster Disney princesses when we discovered the Hipster Ariel Meme. Clever, funny and DISNEY. We were in love. We took the Hipster Ariel vibe and created a one-of-a-kind line of hipster graphic tees, starring your favorite Disney Princesses. Want a unique group costume for your girlfriends to dress up for Halloween? You and your man can be the hit of the party with your Disney couples costume. Or, coordinate your whole family with a Star Wars theme, Tangled or Frozen. 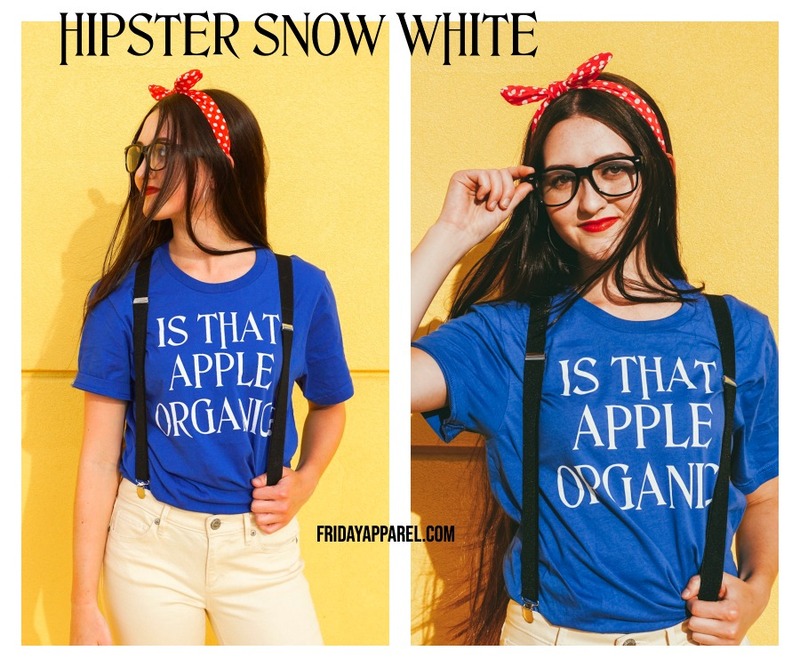 Get a Hipster Princess Shirt and start your Hipster Disney Princess Costume. Our Hipster Princess Shirts can be dressed up easily with a pair of hipster glasses and suspenders from Amazon. From there, be as unique as you want with the additional accessories. This is where the fun comes in! Here’s how we dressed up our Hipster Disney Princesses, with links below each photo to some of the accessories we purchased to complete each look. If you think in Disney quotes, love listening to Disney music on repeat, and can easily answer which Disney Princes is your crush (Aladdin! — wait, Flynn! — no, Prince Naveen! ), then our Hipster Princess Collection is for YOU. Not only are these graphic tees magically cute, they’re also soft and comfy, with a great fit. We hope you got some Disney Hipster Princess inspiration today. We can’t wait to see you in your Hipster Princess Shirt. Tell us in the comments which princess you’re going to be!